You may be thinking … But Laura! Not all adoptees need therapy! By constantly self-victimizing, we perpetuate our “adopted child-ness,” and keep others from giving us the rights we deserve! You’re setting back the cause! How will politicians take us seriously if we’re constantly pathologizing our experience? How can you need therapy for experiencing an injustice? Do the Occupy Wall Street protesters need therapy because they are highlighting and injustice? No! They are justified in their anger! Just because we examine the inherent loss and trauma (that affects adoptees to various degrees) of adoption (because adoptees literally lost a family before they gained one) … doesn’t mean that we are damaged. Just because we write about how various mental health diagnoses relate to the adoption experience, doesn’t mean all adoptees should be in therapy. Just because we desire to discuss and unpack our Issues (or even potential issues—before they become issues with a capital I), doesn’t mean we are navel-gazing self-victimizers. Processing our emotions and advocating for equal access to Original Birth Records are not mutually exclusive activities. It’s possible some activists do in fact need therapy. Just sayin’. 1. Pair up a mental health provider (MHP) with an adoptee, first or adoptive parent—and have them discuss a specific issue. 2. Write on your own. Adoptees are uniquely qualified to talk about how adopted-ness played out in their lives. Adoptees (and those who love/resent/hide from them) go into therapy because they feel *something* unpleasant, but they can’t get to the root of it. Many therapists are woefully bad at helping with unaddressed post-adoption issues. Sometimes adoptees need therapy to figure that out, but the reality is that our basic adoptee-ness does not mean we are damaged or crazy. We may need therapy to realize and understand and process how adoption affected (affects!) us. We may need someone capable to help us process and move through maladaptive, self-destructive behaviors. 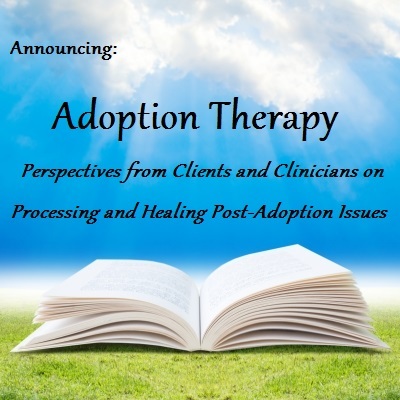 SO MANY therapists are at a complete loss as to how to address the underlying cause— which can be intertwined with adoption experiences. (NOT ALL, I know!) But the moment we look at something through our adoption glasses, we can decide whether it applies or not. Bi-polar, borderline personality disorders–how much of that are unaddressed post-adoption issues? Email me laura @ adoptedrealitymemoir.com (without the spaces) an abstract of 100-300 words, detailing your project idea. If accepted, 3000-5000 word articles will be due May 31, 2014. Sorry I wasn't clear! No — all are welcome. We need more first moms!!!! Hmm, I am interested in contributing. Just need to sit on it awhile and come up with an idea. I'm based in the UK and very interested in submitting – is that ok? Yes! That would be amazing — it's international! I’m hoping someone knows who my birth mother could have been because all I got was her name S. Davis, originally from North CarolinA but had moved out here to Los Angeles Calif and was a dancer and singer she met my birth father J Speeth got pregnant at 20 and had me July 11, 1966 at Cedars of Lebanon, which is now Cedar Sinai Hospital. Hypocritical and Hyper-Critical are two different parts yes it's not become of any thing. But if you want to use them then use separately it's much better then combo.The tips that you give about it also benefit for us if you use it properly. I like this place and good application .https://olioboard.com/users/freerobux/.just use the website thanks for a sharing it. Thank you so much. I hope to see more news from you.